Owners of land adjacent to a flowing stream often know all too well the issues of land erosion. The property loss can often be devastating, consisting of lost acreage and, in worse cases, structural damage to existing buildings. Fortunately, as time has passed, the remedy for such problems has become far more manageable for owners and construction managers, often partnering with Hammer and Steel and ABI, Inc. for a permanent solution. One such issue occurred along the Little Papillion Creek, a major watershed through the center of Omaha, Nebraska. The creek traverses through densely populated areas built up along its banks over the years. 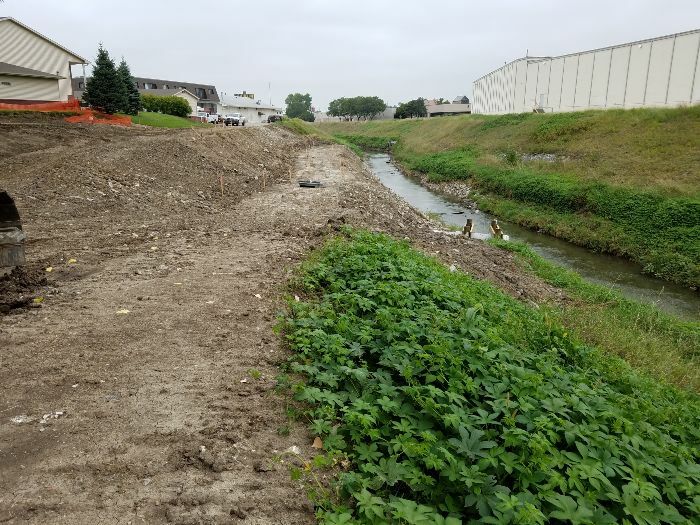 Running between apartment buildings and the local Nebraska Furniture Mart, ground water has been flowing from the high bank of the creek, creating erosion issues. Several low-cost remediation attempts occurred over the past few years, all without success. The bank continued to erode and the creek channel continued to slide east, impacting the retail structures throughout the area. Recently, the Army Corps of Engineers devised a more permanent solution. 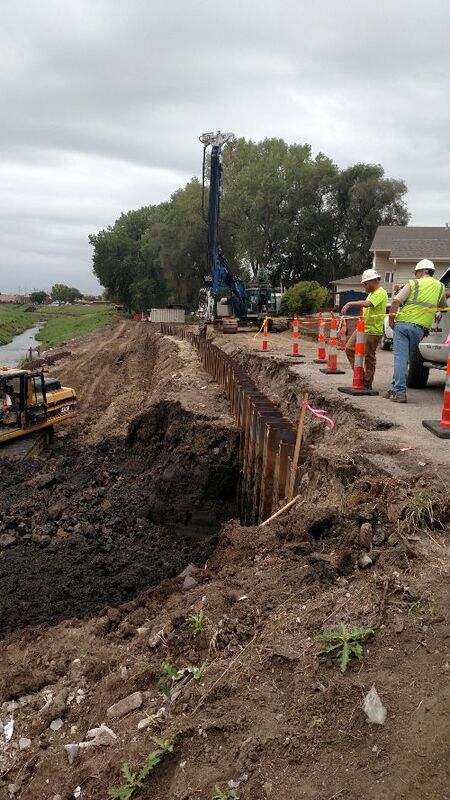 The Corps chose to install two separate sheet pile shoring walls along the west channel bank. The top wall has a length of 230’ at grade, and the second wall at a lower elevation is 195’ in length. Each wall is made up of 35’ long PZ40 sheet pile. Between the two walls a well will be installed to allow ground water pressure to be relieved into a culvert which will flow downstream of the problem area. There is only 15’ of easement into the apartment parking lot on the upper wall, and a 35’ distance between the two walls. 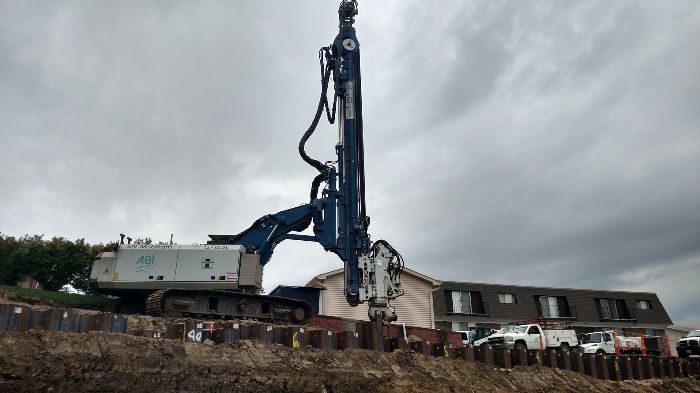 Because of this, a traditional crane and suspended vibratory pile hammer system would not work to install the steel sheet piling due to the cramped conditions, nor would it provide a safe jobsite. The Corps contracted with TCW Construction Inc. from Lincoln, Nebraska to carry out this work. 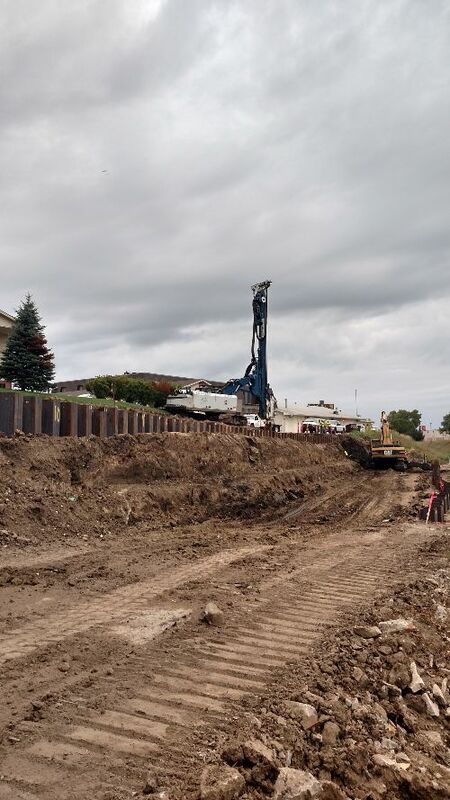 TCW sub-contracted the sheet pile installation to Kerns Excavating Company of Plattsmouth, Nebraska. Kerns Excavating chose the ABI Mobilram TM 13/16 SL to install the sheeting. The Army Corps of Engineers plans to add footage to the wall in the future as their budget allows.